“Come,” he said. Then Peter got down out of the boat, walked on the water and came toward Jesus. But when he saw the wind, he was afraid and, beginning to sink, cried out, “Lord, save me!” Immediately Jesus reached out his hand and caught him. “You of little faith,” he said, “why did you doubt?” (Matthew 14:29–31). It was Mickey’s bedtime, and after their usual bedtime ritual, his parents turned out the lights. For a 6-year-old kid, a dark room can be pretty scary. After pulling the covers over his head, Mickey slowly lowered them and began looking around his room. He noticed it wasn’t as dark as he had feared. He realized that his room was enveloped by a different kind of light from the streetlight outside. The light was pouring into the darkness, and Mickey’s fear evaporated. His fear of darkness was defeated by a light greater than darkness. As Christians, we must allow the fear of Christ to defeat our deepest darkness. The Bible says, “The fear of the Lord is the beginning of wisdom (Proverbs 9:10).” This is the kind of fear that promotes freedom—freedom from life circumstances and pitfalls that are always before us. “Blessed are those who fear the Lord, who find great delight in his commands. They will have no fear of bad news; their hearts are steadfast, trusting in the Lord. Their hearts are secure, they will have no fear” (Psalm 112:1, 7–8). In the passage of above, it was fear that aroused the best out of Peter. It was the fear of the unknown and unexposed that brought him to the point where he would find that in Christ, fear is defeated. This is the kind of fear that is the first cousin of doubt and disbelief. Peter had to step out of the boat of doubt and fear in order to step in to the boat of faith and hope. Jesus had urged His disciples to get into a boat as He dismissed the crowd. For Christ, timing is everything. We will never be able to defeat our doubt and fears until the time is right. All the conditions must be perfect. 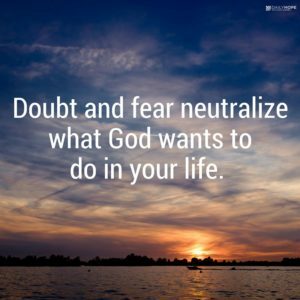 If anything is out of line, doubt and fear will extinguish our faith and hope in Jesus. As the wind and waves beat against the faith and hope of the vessel of the souls of the disciples, Peter saw something. It was Jesus walking on water. Peter passionately thirsted to walk on water too with Jesus. “Come on,” Jesus said, “Peter, you can do it.” And Peter did. He walked on water. Yet Peter allowed a speck of darkness to obstruct the light of his faith. Don’t be like Peter. Don’t allow doubt to defeat your faith. Authentic faith never allows doubt to defeat our faith in Jesus.